Beverly Hills has always done things a little differently. Guest houses have bowling alleys, dogs have personal shoppers, and on a very good day you'll find a bold new Mediterranean restaurant that looks like a kitchen on a ritzy spaceship. 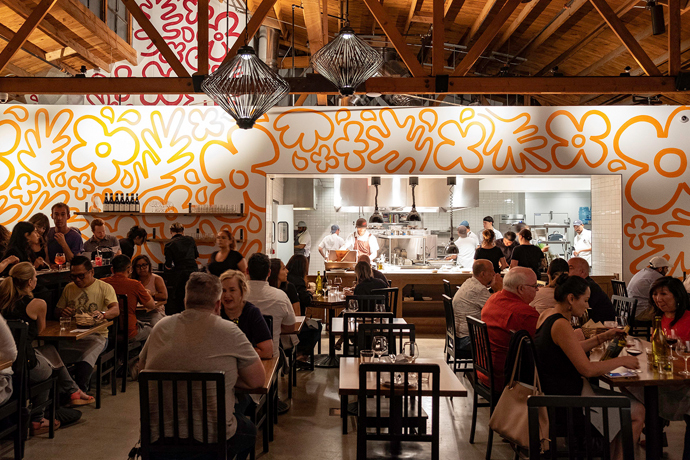 Welcome to Momed—a gleaming ode to Eastern Mediterranean curiosities (plus wine) that's soft-open now on South Beverly Drive. Basically, this is where you'll go to sample foreign fare with a 90210 twist... even if you're technically in Beverly Hills, 90212. And if you want, it can be an all-day love affair. At 8am, head all the way to the coffee bar in back for an Americanized take on rich, gritty Turkish coffee (they also have Intelligentsia), then find a table for your morning dose of eggs and Persian mint on freshly baked Lebanese flatbread. Lunch or dinner brings Duck "Shawarma" (it's like a Middle Eastern gyro, plus duck) and "Djemaa el Fna" (it's escargots). You'll order at the counter and take a seat at the central communal table to befriend strangers inside... or out on the front patio to entice pedestrian passersby with your baba ghanoush (your literal baba ghanoush). And after sundown, this'll work as a good date spot when you feel like working through unusual wines, along with Cyprus-born lagers and the occasional Lebanese pilsner.